The Hand: a Tale of Old Belfast - ZineWiki - the history and culture of zines, independent media and the small press. 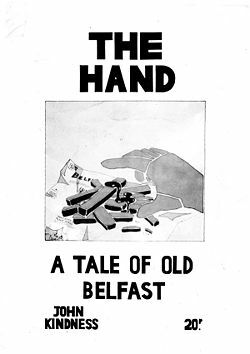 The Hand: a Tale of Old Belfast is a one-off comic created and published in Belfast, Northern Ireland, by John Kindness in 1976. In twelve A4 pages, illustrated in a variety of pen and ink styles with few words, it tells the story of a young man named Sammy who hangs around street corners and causes small-scale trouble in north Belfast, until he is killed in a drive-by shooting. Kindness has gone on to be an internationally renowned fine artist. This page was last modified on 26 August 2010, at 11:56.